at airports in Frankfurt, Amsterdam, Brussels, Dublin and Paris. of Britain’s most famous Eurovision entries from past years. “Just a Little Bit”, by Gina G.
“no to airport expansion” written in several languages. to airport expansion is growing across Europe. continuing – and strong – opposition to a third runway. European airports on the day of the “Eurovision Song Contest"
Rhein-Main/Frankfurt, in Brussels and Dublin. across Europe. 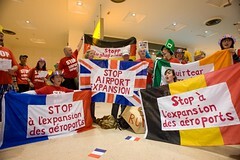 European campaigners are giving ‘nul point’ to airport expansion,"
sowie in BrÃ¼ssel und Dublin. wieder verschwinden. Flash-Mobs erregen bei den Umstehenden Neugier und Verwunderung. Protest at Dublin Airport against another runway. 12 noon – on the dot! 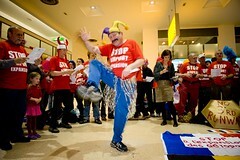 The Flashmob has been arranged on the same day as the Eurovision Song Contest. They group also will sing new lyrics (2) to Ireland’s Eurovision entry “Et Cetera”. didn’t make it to the final but unlike Sinead Mulvey we’re not going home early. 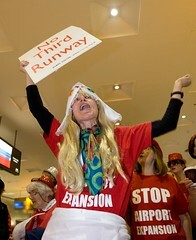 she work on her singing career as air travel has no place in a sustainable future. Posted: Saturday, May 16th, 2009. Filed in News about Airports.